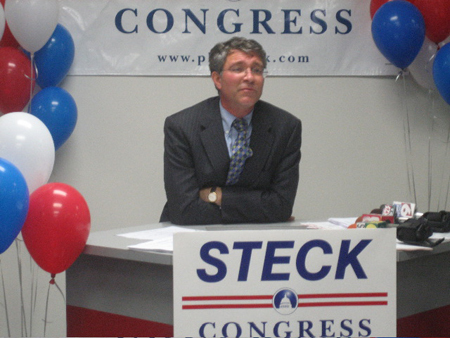 It was a melancholy end to Phil Steck’s 21st District congressional campaign last Tuesday night. Right up until the polls closed at 9 PM no one really had a clear idea which candidate was leading, so the results were a surprise for a lot of people. At least we didn’t have to wait all night for results. I wandered into Steck campaign headquarters on Central Avenue in Albany around 9:45, and immediately noted that the mood was not celebratory. But the crowd of supporters was not downbeat either. Mostly, we were all anxious in our ignorance, waiting for some solid information. In the back of the big storefront, veteran campaigner Judith Mazza was working the computer, pulling up county web sites. The local governments appear to have learned to post vote tallies online as they come in, which is easy and convenient. And fast. No more waiting for the TV stations to divulge tidbits of polling information as they see fit. I can’t tell you how many times I’ve stood around past midnight at somebody or other’s campaign headquarters waiting for vote totals to trickle in by telephone or by TV. If the candidate was trailing, the wait turned into a grim death watch. If the candidate was leading, then everyone’s early evening excitement would slowly turn into barely concealed ennui as the hours passed. I joined several others who were leaning over Judith as she stared at the laptop. Schenectady and Rensselaer counties posted first, and the numbers did not look good for our side. Mr. Steck would have to win big in Albany County to overcome the deficit. 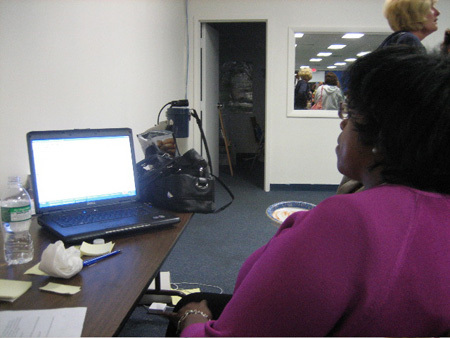 But a little after 10 PM we watched some results trickle in from the City of Albany site, and we started to realize that it was over. Still, I was kind of surprised when Phil Steck made an entrance a little after ten thirty and announced that he was conceding, and was endorsing the winner. Delivering that kind of speech has got to hurt, especially in front of TV cameras. If that was me up there after all that campaigning, I’d probably yell incoherently, whine piteously, make a series of baseless accusations and finally collapse into a fit of sobbing. What fun that would be for the couch potatoes at home. Mr. Steck, self-controlled as always, did none of that. He did allude in his speech as to how the “progressive” vote for this primary was split between him and another unnamed candidate. Later, when he was making the rounds of the room to thank everybody, he confirmed that he was alluding to first-time candidate Darius Shahinfar. Indeed, Mr. Steck and Mr. Shahinfar had very similar positions on the issues, and during the campaign managed to pull the other two serious candidates away from the standard politically correct far right attitudes that the corporate media considers acceptable. For example, back in December I listened to candidate Tracey Brooks happily dish out double talk about the War Against Iraq, saying she was strongly opposed to the war but not in favor of ending it just quite yet, that kind of crap. But thanks to the public response to the positions of Mr. Steck and Mr. Shahinfar, by late summer Ms. Brooks was a staunch opponent of the War, and had always been. Despite trailing in fourth place, the campaign was a success for Mr. Shahinfar. Running his first bid for office, he demonstrated a clear grasp of the issues and the ability to run a credible campaign. Everyone agrees, he’s a guy to watch from now on. The numbers do not support Mr. Steck’s initial explanation for his loss. If you add up his and Mr. Shahinfar’s totals, they don’t add up to the total for winner Paul Tonko. Clearly, something else defeated Phil Steck, who was the first announced serious candidate, first out of the starting gate as it were. As I pointed out a while back, the corporate media was doing everything it could to marginalize Phil Steck. His name and his candidacy were consistently buried three quarters of the way through the newspaper articles, which is the part of the stories that a reader is least likely to read and comprehend. And in a final indignity, kicking him when he was down, the Hearst Times Union did the same thing to him one more time with their morning after the election article, even deliberately omitting his vote total. But there was something deeper going on. I noticed throughout the campaign that the Daily Gazette, which is not owned by a corporation, engaged in even more marginalization of Mr. Steck than did the Hearst Rag. This alone certainly killed most of his chances of building support in the western part of the 21st District, where the Gazette is the daily paper of choice. This policy by the Gazette effectively gave Paul Tonko, who is from around Amsterdam, a free ride on his home turf. Even publications like Metroland and the Altamont Enterprise tended to push Mr. Steck to the sidelines. One is forced to conclude that Mr. Steck does not have good relations with the press, or with the print journalists and content providers generally. And that’s a big reason why he lost. Why exactly the media workers hate him I don’t know, but it appears evident that he had this problem with the press long before he announced his candidacy for Congress at the end of last year. Again, I don’t know for sure, but I had a brief encounter that may shed light on why the media workers do not like him. Back in June I reported in passing how Mr. Steck took control of the Albany County Democratic meeting out at the Polish Community Center, wringing an endorsement out of the party in an impressive display of will power. Near the end of the long meeting, I decided it was time to display my support for Mr. Steck, so I went looking for some lawn signs, which were in evidence all over the hall. So I struck up a friendly conversation with one of his campaign workers, who was busy stacking the signs. All of a sudden, to my bewilderment, one of his senior campaign workers was in my face, engaging me in an overly friendly manner. A moment later the candidate himself appeared before me as if by magic, full of questions about what I was talking about with the first campaign worker (who now looked terrified.) The candidate acted very alarmed and almost confrontational, finally with apparent reluctance granting my request for a lawn sign. Being a basically naive person, it took me a day to sort out exactly what happened. 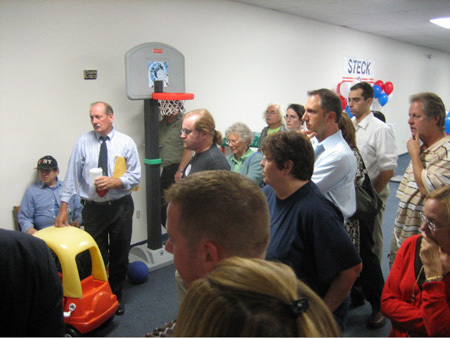 As readers of this blog are aware, I’ve been a supporter of Mr. Steck through much of the Congressional campaign. Indeed that is why I asked to interview him back in March. The feedback I got for that article indicated that my post was the first opportunity that many people had to weigh any of the candidates, and Mr. Steck prominently posted a link to the article on his campaign web site. When I struck up the conversation with the campaign worker, I thought of myself as a friendly supporter. But apparently Mr. Steck saw me as “press.” And his policy toward me as “press” was to treat me as a threat that needed to be managed. This is not how you win friends in the media. Certainly, Phil Steck is not a warm fuzzy guy. He exhibits exquisite self control and a tendency to control his immediate surroundings. Along with his firm positions on vital issues that other candidates were afraid to touch, these qualities would have made him eminently qualified to charge into Congress as a freshman and make a difference. But first you have to get elected. That means you have to be able to charm lots of different kinds of people with brief encounters, one after the other. And no matter what you do, you can’t piss off the information gatekeepers. 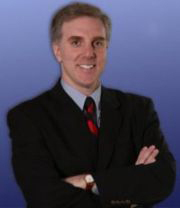 Granting an interview to Albanyweblog in March could not have helped Mr. Steck’s relations with the corporate media, that must have propelled the Times Union editors from strong dislike of the candidate into sheer hatred. But by then his bad relationship with the media was well established and unlikely to be repaired. As I mentioned earlier, it was because of this virtual censorship of his campaign, which I wanted to circumvent in my own small way, that I asked him for an interview. So congratulations to Paul Tonko. Unless the corporate media can unearth evidence that Mr. Tonko has been having intimate relations with a goat, we can pretty much count on him being our next congressional representative. Not that he doesn’t have to campaign, what with the corporate media sure to pull hard for the underdog Re-pub candidate. Albany- Some Democratic party activists have expressed concern about allegations that seem to be centered around Republican congressional candidate Jim Buhrmaster, who is fighting hard to win the wide open seat for the 21st District, which includes Albany and Schenectady counties as well as parts of Fulton, Schoharie and Rensselaer counties. The Democrats, floundering for an issue that might resonate with the voters, are attempting to divert attention in the direction of Mr. Buhrmaster’s personal life. But the Republican candidate, delivering a strongly worded statement, dismissed the claims as frivolous and intrusive. “It’s time to move on,” the Republican announced firmly. 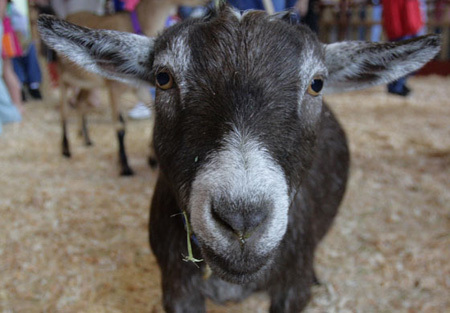 “It’s time to stop focusing on what a goat may or may not have done. The video on YouTube does not add to the discussion. Let’s talk instead about rounding up immigrants well before they crawl through your bedroom window and eat your children, not after the carnage because then it will be too late to save our sons and daughters,” he said. Etcetera. Of course I support Paul Tonko for congress. I do not suffer from chronic self-loathing, so there is no way I would ever support some spineless irresponsible Republican. They’re all the same, you know. But I do have some reservations about the winner of the Democratic primary. One big specific issue is his record on energy policy. 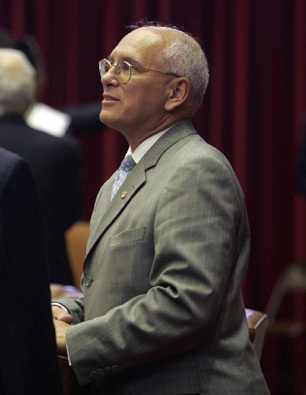 As a senior Assembly representative, Mr. Tonko is generally credited as having been one of the chief architects of “energy deregulation” in New York State, which could more properly be called “energy decriminalization.” As it has been conceived of and implemented, “deregulation” has proven to be both an economic and an environmental disaster for our state. Mr. Tonko is on record as having opposed energy "deregulation" when it was imposed by fiat upon this state by former governor George Pataki. Yet Mr. Tonko is also very much on record, as chair of the Assembly Energy committee, as working to modify the policy. As far as I can see, his efforts had little effect and only served to give a legislative stamp of approval to this failure to govern properly. The big general problem, as I see it, is that Mr. Tonko is a compromiser. This is usually presented as one of his positives, an ability to bring opposing sides together. He is frequently credited with having been one of the few bridges between the notoriously dysfunctional state Senate and the notoriously dysfunctional State Assembly, which is certainly no small accomplishment and no mean skill. But times have changed. We are at a point in our history where the American people can no longer afford compromises with the forces of evil. There is almost nothing left to compromise away. We need representatives who are willing to confront and fight against our corporate enemies and against their obedient political representatives. And I wonder how much Mr. Tonko is willing to compromise with the corporate media. Michael McNulty spent much of his 20 years as our congressional representative in thrall to the media, afraid to make a stand that would upset them. On the other hand, we see how an uncompromisingly adversarial relationship with the entire media killed Phil Steck’s candidacy. His uncompromising attitude, along with his strong stand on the issues, was why I supported Mr. Steck in the Democratic primary. I wanted a representative who was willing to walk onto the floor of Congress and start swinging his fists. I really didn’t care about his personality, I wanted a fighter to represent me, not a slug. To be fair, Mr. Tonko came to the race with a reputation that he had built up over his many years in the Assembly. I’ve spoken to quite a few people who have told me stories of how he came through for them or for their organization. Often this was from people who didn’t even reside in his old Assembly district, a sure sign that his political vision is wide. And we have to remember that he had the enthusiastic support of several large and strong unions. We’re basically talking about a small army of well organized volunteers out hitting the streets for him. You can’t buy that kind of support, which presumably will carry over into the general election. There was plenty of respect for Paul Tonko among the Phil Steck supporters on that Tuesday night. We gathered around the TV as Mr. Tonko announced exuberantly that he expected to win. No one threw any jibes or smart comments, we all listened solemnly and quietly. 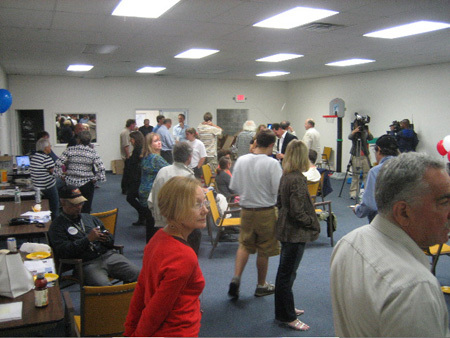 But later on when Tracey Brooks gave her concession speech on the TV, there was a different reaction in the room. Early on in the race Ms. Brooks was touted by the corporate media as the favorite to win, picking up some key endorsements. Indeed, while Michael McNulty himself did not make any endorsements in the race, his family members supported her in a big way. What happened? I would say that Tracey Brooks’ biggest and most fatal error was to openly embrace the endorsement of Albany Mayor Jerry Jennings. From that moment on she became identified as Jerry’s candidate. And in my opinion, from that moment on the only way she could have won was if all the other candidates started dating goats. Ms. Brooks conceded on the TV screen flanked by Michael’s daughter, Green Island Mayor Ellen McNulty, and by none other than Jerry Jennings. After she finished gushing she gave Ms. McNulty a quick hug. Then she turned to Jerry and... well, she embraced the old goat. Like, intimately. Oh, you should have heard the jeering. Some of it was not very nice. You don’t usually hear hard-nosed political campaigners let loose like that, but hey. It had been a long day, and a long primary campaign. Awesome wrap-up, Dan. You are incredibly right on the money when it comes to the media blackout of the Steck campaign, the plus-and-minuses of Paul Tonko, the resiliencey of Darius, and the poor showing by Tracey Brooks. I remember reading your interview of Phil Steck way back when. I decided that perhaps I could do the same thing, so now on my diaries on DailyKos and The Albany Project, there's interviews from all four major candidates as well as extensive coverage of the biggst debates held and tons of weekly-wrap ups and editorials for anyone interested in taking a nostalgic looks back (already?). That point about the TU not printing Phil Steck's numbes is excellent. Y'know, I don't buy the Times Union to find out the news anymore - by the time it's printed, we already know it thanks to the blogs. But I still pick it up just to keep tabs on how awful the reporting and editing is: that article also claims that the Steck campaign went to Colonie Police becaus a Brooks "contributor" was stealing his signs off the roads. I blogged this, and I'm so sick of reiterating the facts that I'm willing to let the past be the past. I wonder if you have any thoughts on the primary for State Senate in the 46th District. If you think Phil Steck's race was blacked out by the media, definitely take a look at what happened to David Weiss as he challenged 12-year incumbent State Senator Neil Breslin this year as well. I guess my Stick with Steck t-shirt isnt going to be the center piece of my collection. Darn. I have a different take on all of this (shock I am sure). I dont think Steck's anti-war message got ay traction with the voters. No one cares and he couldnt make them. I often gauge these things based on friends' positions, like yours, and I got a virulently anti-Steck e-mail from one, based on Steck's "going negative" ads. I think this is valid. Tonko had the WF people working for him. I got the sense that all of them were "antiwar" at some level, esp. Shahinfar, so it wasn't the distinguishing feature it might have been. Every single one of the first several pieces I got from Brooks suggested that she was going to be the "woman candidate"; only one man (a doctor) appeared in her early literature. I really felt she didn't WANT me to vote for her, that she'd let the guys split the male vote so she'd win, AND this was a way for disaffected Hillary voters to get a second chance. Shaninfar's first name was so prominent that people didn't know who he was; seriously, I only figured out who "Darius" was in the last month. Steck proved to be the prick people painted him to be. It didn't take him long to go negative. How could his supporters call that progressive. Hillary I mean Brooks represent the double standard whites enjoy courting white voters. Add the female thing and you have a strong possibiity of winning by numbers alone. Darius one-on-one very engaging good future prosects. Paul Tonko the winner! It's tough to rock the boat in a conservative, company town. Steck decided to take on serious issues that resonated on a nation level and set off alarms in lobbied up Albany. Phil was up against the main stream,status quo designate Tonko, right of center shill Brooks and Darius McEneny. As far as the comment put out there that Phil went negative, what was it that Steck lied about? No gripe about Tracey going negative though. Hey, Steck didn't point out Shahinfar's inability to hold a job down for over two years either. Face it, Tonko hasn't met a lobbyist that he wouldn't take a donation from and his public stances on labor, energy and health care issues are in serious conflict with his quarter century donor base. Pointing out Paul's conflicted public record was progressive and bold. Wouldn't expect that from M.Tracey or Rachel, I mean Darius. Don't be surprised if Darius tries to land a Tonko staff job while Jack and Rachel chart the Shah's next move. (Still love having seen Russo and Darius signs lining Rte. 9 in Saratoga back in August.) Things must look real good for KG if two of her crackerjack staff can peel off and run for offices while she runs for re-election.